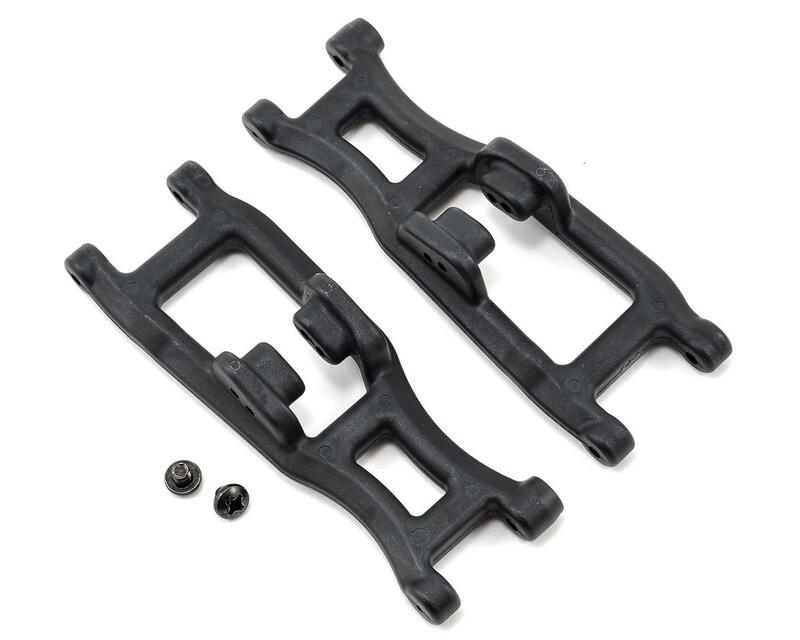 This is a pack of two black RPM Associated Truck Front A-Arms. The SC10B, SC10.2 & T4.2FT gull-wing style front A-arms have had RPM customers asking for help. This shape has been less durable than RPM customers require. The RPM A-arm design eliminates the gull-wing shape in favor of a straight A-arm design with a lowered shock mount position to retain stock suspension geometry (the shock slips through the center of the A-arm perfectly), yet the straight A-arm style improves durability immensely. 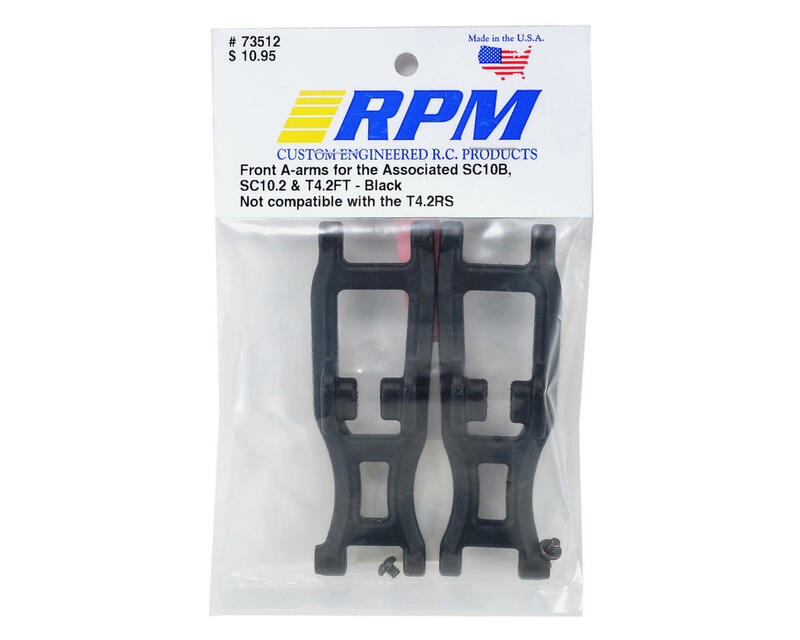 To help improve overall durability, RPM focused their attention on the hinge pin retainers. The stock set-up uses a small screw placed next to the hinge pin, relying on the head of the screw to keep the hinge pin in place. This screw hole adds a weak spot on the A-arms. RPM A-arms eliminate that screw in favor of an in-line screw to keep the hinge pin in place thus increasing the durability of the A-arms even further. Lastly, RPM removed as much slop from the A-arms as possible. They found as much as .005” (or .127mm) of slop in the stock a-arms in each hinge pin hole. That equates to camber, caster and toe angle settings that will not hold true to their settings. That is no longer an issue with RPM A-arms. Each hinge pin hole is a perfect fit, with less than .001” (or .025mm) of clearance for optimal suspension settings. RPM A-arms are designed to meet a wide range of demands, from the toughest backyard basher to the smoothest track-built racer, RPM performance parts will get your ride to the finish line! NOTE: These replace stock Associated ASC91201 and are sold in pairs. They are not compatible with the T4.2RS. The T4.2RS uses standard RPM T4 front A-arms - ASC70762 or ASC70765.